Vol 1 | Issue 1 | July – Sep 2015 | page: 7-11 | Dhiraj V Sonawane. Grant Medical College and Sir JJ Group of Hospitals, Mumbai. India. Asst. Prof. Grant Medical College and Sir JJ Group of Hospitals, Mumbai. Intertrochanteric (IT) fractures are most common fractures seen in elderly osteoporotic, usually due to simple fall in the house. With increasing number of elderly patients its number is estimated to be double by 2040 . Understanding important factors in management of IT fracture like stability, reduction, role of posteriomedial wall, lateral wall, will help in choosing implant for better outcome. Most classifications are based on these factors and help in selecting management protocols. Many classification systems have come from last 6 decades, but none of them are found to be unanimously acceptable worldwide. Few classifications have focussed on stability and anatomical pattern (Evans; Ramadier; Decoulx; & Lavarde) while others on maintaining reduction of various types (Jensen’s modification of Evan’s, Ender; Tronzo, AO). An ideal classification should be simple, reproducible, easy to apply and should provide information on stability after reduction, secondary displacement, technique of fixation, postoperative mobilisation, outcome, and also data organisation for research. It should have good interrater and intrarater reliability and validity. -Displaced but after reduction overlap of the medial cortical buttress make the fracture stable. -Displaced and the medial cortical buttress is not restored by reduction of fracture. -Displaced and comminuted fractures in which the medial cortical buttress is not restored by reduction of the fracture. Type II: Reverse obliquity fractures. 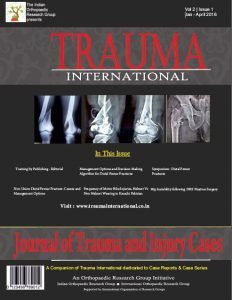 Clinical importance: This helped in better understanding of intertrochanteric fractures based on stability of fracture after close reduction and skeletal traction. According to Evans, posterior-medial cortex continuation is important for restoring stability of IT fractures. Based on this he classified IT fractures into Stable and Unstable fractures. Stable fractures have intact or minimally communited posteriomedial cortex, while Unstable fracture has greater communition of posteriomedial cortex. Unstable fractures after reduction can be converted to stable fracture if the posteriomedial cortex opposition can be achieved. Reverse oblique pattern was considered inheritably unstable fracture as distal femur has tendency to drift medially due adductor pull. Jansen (1975 ) later modified Evans classification into three groups. Clinical Importance: the classification reduced the number of types from 6 to 5 by including the extremely rare fracture with a reversed oblique fracture line and large greater trochanter fragment into Type 3. Modification of the Evans system offers the best prediction of the possibility of obtaining reliable anatomical reduction and the risk of secondary fracture dislocation. Type I fractures consist of nondisplaced stable intertrochanteric fractures without comminution. Type II fractures represent stable, minimally comminuted but displaced fractures; these are the fractures that, once reduced, allow a stable construct. Stable fractures are not a problem and hold up well with any type of fixation device. Type III intertrochanteric fracture is a problem fracture and has a large posteromedial comminuted area. Type IV fracture is uncommon and consists of an intertrochanteric fracture with a subtrochanteric component. This is the most difficult type of fracture to fix because of the great forces imposed by muscle forces and weight bearing on the subtrochanteric region of the femur. Clinical Importance: Addition of new variant (type 4) extension of intertrochanteric fracture in neck. In the Comprehensive Classification of Fractures of the Long Bones, Müller and colleagues coded proximal hip fractures to offer a uniform alphanumeric fracture classification. This system was advocated by the AO/ASIF, and later adopted by OTA in their Fracture Compendium. According to AO/OTA alphanumeric classification intertrochanteric fractures (Type 31A) Bone = femur = 3,Segment = proximal = 1,Type = A1, A2, A3 A1: simple (two-part) fractures, with the typical oblique fracture line extending from the greater trochanter to the medial cortex; the lateral cortex of the greater trochanter remains intact. A3: fractures are those in which the fracture line extends across both the medial and lateral cortices; this group includes the reverse obliquity pattern or subtrochanteric extensions. Clinical importance: This helps in predicting prognosis and suggests treatment for the entire spectrum of IT fractures. Fractures A1.1 through A2.1 are commonly described as stable, and fractures A2.2 through A3.3 usually are unstable. Generally, the Evans-Jensen type I fracture is represented by the 31-A1 group. Evans-Jensen type II fractures are in the 31-A2 group. The so-called reverse obliquity intertrochanteric fracture is in group 31-A3. It’s alphanumeric and standardized format make this system useful, particularly for research and documentation. They were first to mention instability in both coronal and sagittal plane. This classification, included fractures from the extracapsular part of the neck to a point 5 cm distal to the lesser trochanter. Type 1: Fractures that extend along the intertrochanteric line. Type 2: Comminuted fractures with the main fracture line along the intertrochanteric line but with multiple secondary fracture lines (may be in coronal plane). Type 3: Fractures that extend to or are distal to the lesser trochanter. Type 4: Fractures of the trochanteric region and proximal shaft with fractures in at least two planes. Type 3- these fractures usually are more difficult to reduce and result in more complications at operation and during convalescence. Type 4- if open reduction and internal fixation are used, two-plane fixation is required because of the spiral, oblique, or butterfly fracture of the shaft. Tronzo incorporated Boyds and Griffin two plane instability in classification. This system is complex to use & not adequate to apply in clinical practice. It has poor reliability, though can be used for documentation of long-term results and comparison of treatment modality. Yet many surgeons prefer it for its simplicity and biomechanical rationale. f: Trochantero-diaphyseal fractures- spiral line through the greater trochanter and into the proximal shaft often with 3rd fragment. Decoulx and Lavarde’s classification (1969):Simple anatomical classification for descriptive purposes. Clinical importance: Its simple and based on biomechanical concept. Briot’s found posterior wall fracture is important for sagittal instability and external rotation sometimes causing malunion in external rotation. Reduction can be done in these by internal rotation reducing the anterior gap while realign the posterior fractured wall. Clinical importance: This classification gives information on injury mechanism, which can be helpful to reduce fracture while performing closed nailing. Dr G.S. Kulkarni et al  published his new classification in intertrochanteric fractures based on AO & Evan-Jansen classification. He added new varieties of intertrochanteric fractures described by Gotfried and Kyle . This classification is treatment oriented and will help in deciding the implant according to the fracture type. Type IB- stable minimally displaced. Type IC- stable minimally displaced with a small fragment of lesser trochanter. Type IIA- unstable 3 piece fracture with large posteromedial fragment of lesser trochanter. Type IIB- 4 piece fracture. Type C- Shattered lateral wall. Type IIIA- trochanteric fracture with extension into subtrochanter. Type IIIC- trochanteric fracture with extension into femoral neck area. Clinical Importance: Classification helps in selecting treatment protocols as below. Type I: This stable fractures can be managed by any fixation modality gives excellent results. DHS is implant of choice. Type II: These unstable fractures are described as problem fractures can be managed with DHS with some modification or IMN. Type III: This very unstable fracture with DHS gives poor results. In these type with lateral wall fracture use of DHS lead to excessive collapse, pain, restricted mobility in hip, sometime non union and failure. Intramedullary nails (IMN) are better choice as they prevents excessive collapse at fracture site, better restoration of anatomy and biomechanically stronger implants; Arthroplasty can also be done in select cases. Unusual fracture pattern like basi-cervical fractures extension can be fixed with additional derotation screw as these are also rotationally unstable. Reverse oblique pattern like fracture lateral wall are better fixed with IMN. Various classifications have been proposed over years described the fracture patterns, focusing on importance of posteriomedial and lateral wall for stability. Tronzo classification is found to be less reliable and not useful in clinical practice. AO/OTA and Dr G.S. Kulkarni et al modified classification has described in detail the preferred implant according to the fracture type. An AO/OTA group has good reliability but subgroup assessment has poor reliability; it is more useful in record keeping, deciding management and research. Kulkarni et al classification is found to be more simple & easy to apply in practice, record keeping and research. There is still no consensus on the best classification but with new biomechanical informations coming through, the classification systems would continue to evolve. 1. 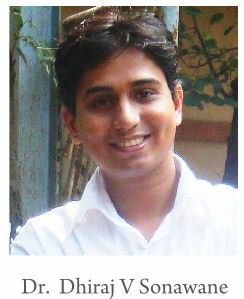 GS Kulkarni, Rajiv Limaye, Milind Kulkarni, Sunil Kulkarni. Current Concept review: Intertrochanteric fractures. Indian Journal of Orthopaedics.2006;40:16-23. 2. Evans, E. M. () The treatment of trochanteric fractures of the femur. J. Bone Jt Surg. 1949;31-B: 190-203. 3. 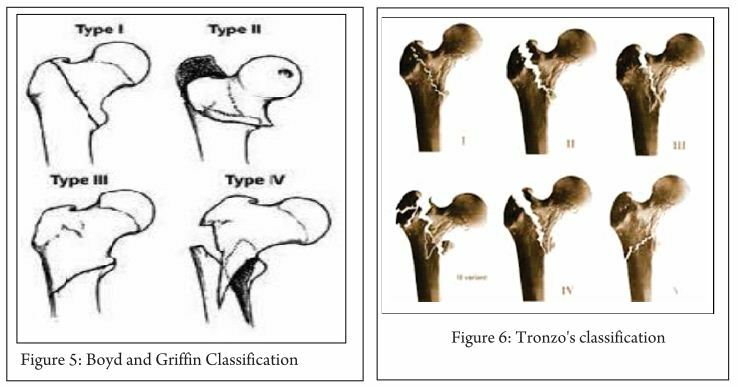 Jensen J. S. Classification of trochanteric fractures. Actaorthop. Scand. 1980; 51:803-810. 4. Kyle R. F., Gustilo R. B. And Premer R. F. Analysis of six hundred and twenty-two intertrochantenc hip fractures. J. Bone joint(Am). 1979;61: 216-21. 5. M.E. Muller, S. Nazarian, P. Koch, J. Schatzker The comprehensive classification of fractures of long bones Springer, Berlin. 1990. 7. Tronzo RG. Symposium on fractures of the hip. Special considerations in management. Orthop Clin North Am. 1974; 5(3): 571–583. 8. M. Bombart, J.O. Ramadier Trochanteric fractures Rev Chir Orthop, 52 (1966), 353–374. 9. Decoulx P, Lavarde G. Fractures of the trochanteric region. A statistical study of 2,612 cases. J Chir (Paris). 1969; 98(1):75-100. 10. Briot B. Fractures per-trochantériennes: anatomie pathologique et classification. Cahiers d’Enseignement de la SOFCOT Expansions Sci Franc.1980;12: 69-76. 11. J. Ender Per- und subtrochantere Oberschenkelbrüche. Hefte Unfallheilk;1970:106, 2–11. 12. Gotfried Y. The lateral trochanteric wall. Clin Orthop. 2004; 425:.82-86.